As I settle in on my Icelandair flight from Reykjavik on my final journey home, I am happily surprised to discover a new series on the in-flight entertainment system (watching tv while flying is peculiar pleasure for me.) It wouldn’t take much for a Saga enthusiast like me to get excited by the very notion of such a documentary series but the lively intro to Ferðalok (or Journey’s End in English) provides a compelling contrast to most other historical documentaries. The gripping musical score immediately transported me into a world of stunning Icelandic characters captured with hip cinematography, where sweeping views of the Saga landscapes provide the setting for reenactments of events we may have read and imagined but have never witnessed with such vividness. Produced in Iceland, Ferðalok endeavors to compare the literal events of the Sagas with contemporary archeological research and interpretation. By exploring how the Sagas can be directly linked with a tangible environment, this new mini-series will undoubtedly reawaken an interest in these old heroic stories, which have defined the culture of a nation where almost all of the citizens can retrace their family lineage back to the first settlers. Besides being fashionable and entertaining, Ferðalok is smart. 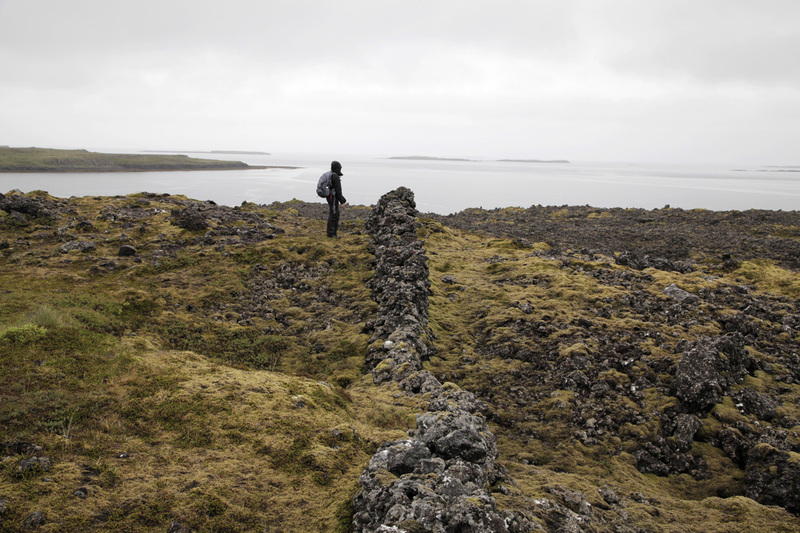 Combining English and Icelandic narration, the program is written and hosted by the young and stylish lady archeologist Vala Gardarsdottir, who guides the spectator to various significant Saga sites and discusses the course of events and their analysis with other professionals in the field. The on site archeological explorations are assembled with reenactment scenes of the Sagas and studio interviews with even more experts who provide a vast spectrum of scientific, literary and sociological interpretation. As of yet, six episodes have been released. Without going into too much detail about each one, I will disclose what is predicable: half of the episodes deal with the Islanders’ favourite – Njal’s Saga. Granted this story has been deemed to be the most sophisticated in terms of its narrative complexity and style of writing, I hope that a continuation of the series will move on to look at events from the less popular Sagas. I am however very pleased that episode 3 was dedicated to examining the persona of Auð the Deep Minded, the most prominent woman of the settlement age. Auð was not only the leader of one of the most successful settlement expeditions, but she is mostly known as a historical figure rather than a Saga character – her character positions the series smack in the middle of a world which oscillates between history and mythology, archeology and storytelling. Although it is not necessary to read the sagas before viewing Ferðalok, I highly recommend it to feel like a participant in unraveling these stories. View the trailer here but note that the musical score of the trailer is outdated and differs from that of the show, which was a change for the better. 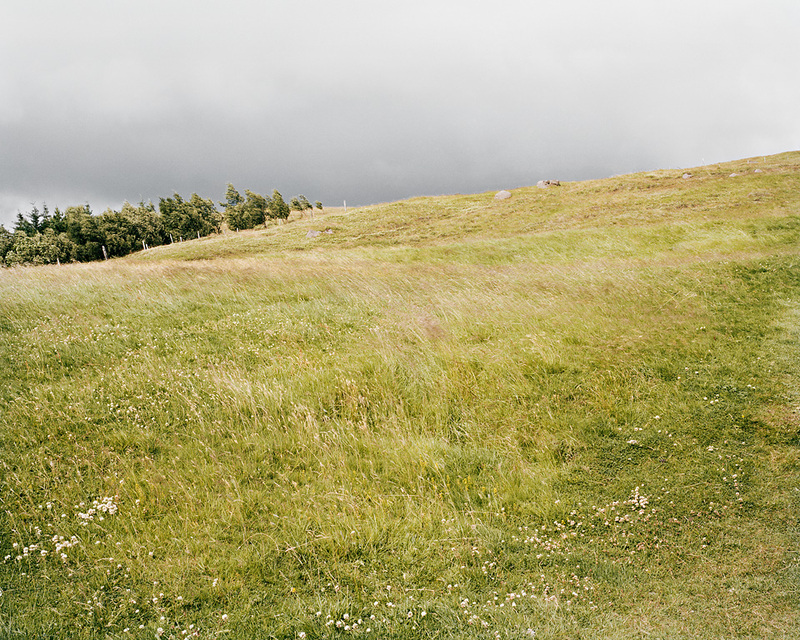 I photographed this Njal’s Saga site in 2011 – the infamous hillside of which Gunnar of Hlidarendi says “lovely is the hillside – never has it seemed so lovely to me as now, with its pale fields and mown meadows, and I will ride back home and not leave.” Episode 2 of Ferðalok features this consequential scene that leads to the demise of a beloved Saga hero. I arrived in Iceland almost a week ago, eager to revisit some of the sites at Snæfellsness, a location that was especially significant during saga times. The Eyrbyggja Saga takes place here. The story begins with the settlement of the first chieftain and chronicles events that take place around the Eyr over a few generations. Why I am particularly interested in this Saga is because it is centered on a place, and not a particular character like the more popular heroic sagas. 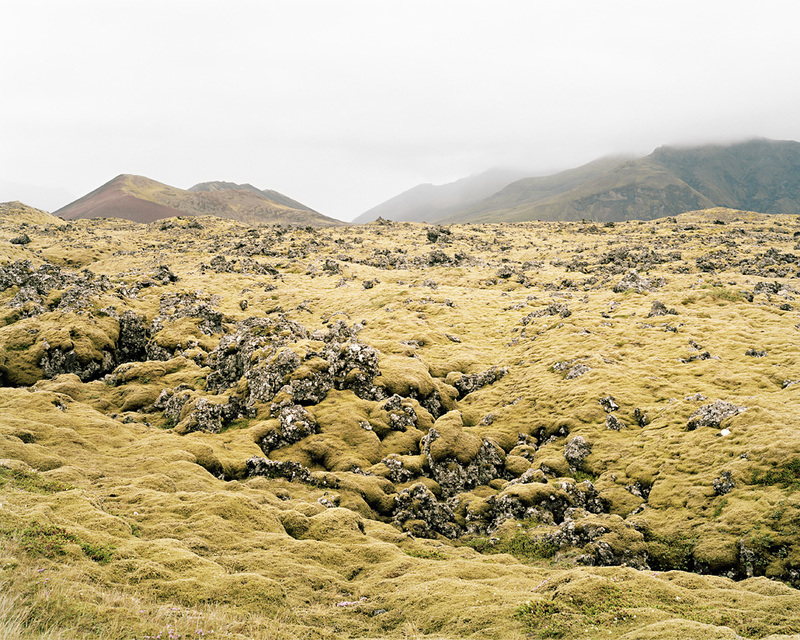 When visiting Snæfellsness, one can engage with the landscape of sagas by walking up hallowed mountains, meandering through lava fields and visiting the farmsteads of the original settlers. I had been here two years ago when the wind and rain were dreadful enough to make it impossible to photograph with a 4”x5” view camera. This time around the weather was fair so I made my way directly to Laugarbrekka, the birthplace of Gudrid Thorbjornardottir, the heroine of the Vinland Sagas discussed in an earlier post. Located in the shadow of Snæfellsjökull, a extraordinary volcanic glacier, Laugarbrekka is steeped in mythology. Gudrid is not the only hero from the area as she lived right next door to Bárdur, the half-man, half-troll guardian of Snæfells. Crossing over to the north side of the peninsula, I went to revisit the Beserkjahraun, the Berserker’s lava field also mentioned in an earlier post. Of course by the time it took to drive there, the weather had turned for the worse. Unable to photograph in the pouring rain, I explored the lava field looking for something I had missed last time, a path still visible from when saga character Killer-Styr had challenged the Berserkers to build a trail and stone fence to both link and divide the neighboring farm. After consulting with the locals and doing some scouting, I found the path and waited overnight with the hope of shooting the next day. The evening was a great opportunity to re-read the Eyrbyggja Saga on site. Thankfully the downpour turned into a drizzle, and in the bright overcast light, the lava field took on a dramatic look. After photographing the Berserkjagata, I did the short hike up to the ruins of a chapel at Helgafell (holy mountain) perhaps the most predominant site of the Eyrbyggja Saga. It was at the assembly near Helgafell where Erik the Red was exiled and subsequently made his journey to settle in Greenland – the next destination on my itinerary. The two sagas that make up the Vinland collection recall the Norse discovery and attempted settlement of ‘Vinland the Good’ in North America. Like the other sagas, this tale was first conveyed through storytelling and then written down hundreds of years later. Interestingly, two separate authors chronicled the expeditions to Vinland, but their versions of events rarely correlate. Many of the characters overlap but play incongruent roles and describe entirely different details, emphasizing the problem of regarding the sagas as legitimate historical references. Where one saga may be correct, the other must be false, therefore tasking historians and archeologists with the mission of sifting through possible truths or fictions. One of the most puzzling of the sub-stories is that of the final expedition to Vinland led by Freydis Eriksdottir and recounted in The Saga of the Greenlanders. Narrated in less than four pages, this story tells how Erik the Red’s daughter quarrels with and deceives the Icelandic merchants who were supposed to share in the profits of the voyage. After a hostile winter in Vinland, Freydis incites the massacre of the entire Icelandic crew and when others refuse, she executes five unarmed women with an axe. Upon returning to Greenland, she lies to her brother Leif Eriksson by telling him that the Icelanders stayed in Vinland. He later discovers the truth. Perhaps the story of the massacre is based on fact, or perhaps Freydis’ character is used as a literary device to contrast the other heroine of The Vinland Sagas, Gudrid Thorbjarnardottir, discussed in an earlier post. Either way, the ambiguity of this tale leaves plenty of room for interpretation and was picked up by Canadian author Joan Clarke in her 1993 novel Eriksdottir. Beginning in Greenland, where an underprivileged Freydis dreams of building a proper house with wooden beams and a real bed, Clarke delves into Freydis’ moral fiber as she begins to build her biography, from her illegitimate conception to her unhappy marriage. Then culling from the four pages of The Saga of the Greenlanders, the story of the fateful mission to Vinland begins to unravel. Clarke retains the original saga characters and then creates others, such as Freydis’ lover Hauk Ljome, a key figure within the complex plot that spans over 400 pages. Ulfar the scribe, another invented character, provides the fictitious documents from which the author draws out this saga. Eriksdottir retains the matter-of-factness of the sagas, but doesn’t give away any suppositions on the extent of Vinland, referring to their destination as Leifsbudir (today’s L’Anse aux Meadows.) As Leif Eriksson explains in the book “If you never go anywhere except Leifsbudir, then for you Leifsbudir is Vinland.” In the true saga-style, those who did venture into the heart of Vinland were fated with a dramatic demise. Clarke’s reckoning for Freydis’ greed and wickedness (though less evil than in the original saga) is drawn from her life’s circumstances, however the author offers a feminist viewpoint by simply presenting the double standard of Freydis’ adultery and violent acts with those of her male counterparts. It is interesting to note that Eriksdottir and the previously reviewed novel The Greenlanders, were both penned by women and cast women as principle characters, bringing a female perspective on an otherwise male-dominated Viking world. 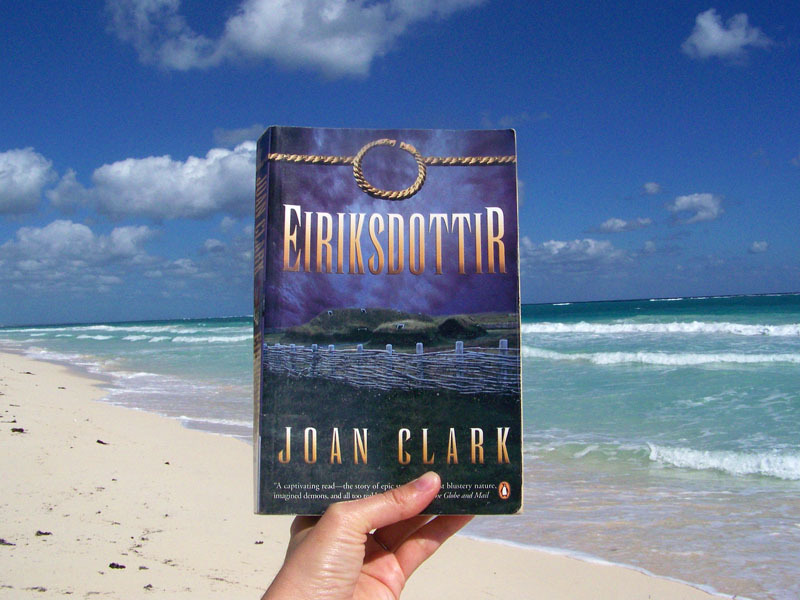 Reading Eriksdottir while on a beach holiday gives a rather exotic impression of what Vinland the Good may have been like for Norse explorers. Québecois readers will know about Jacques Cartier, who traveled from France to explore the Gulf of St. Lawrence in 1534. But was he really the first European to describe and map the St. Lawrence and a great part of Québec? As I mentioned in an earlier post, the Norse Sagas, which describe a place called Vinland, could be the earliest written descriptions of North America. Historians and archeologists have been preoccupied with the location of Vinland for hundreds of years and its whereabouts still remain a mystery. Due to a Norse cloak pin that was unearthed at the L’Anse aux Meadows archeological site, we know that Viking explorers attempted a settlement in Newfoundland, but how much farther did they explore? Some believe that Vinland could be as far south as Cape Cod, or somewhere up the St. Lawrence River. When Jacques Cartier discovered the Sauguenay Fjord, which flows into the Gulf of St. Lawrence, he was presumably told by Iroquoian natives of a kingdom to the north, established and ruled by blond men. Unable to find the legendary place, the Kingdom of Saguenay was dismissed as a local myth, yet the river and greater area still bear the name. Last week, I traveled to the small town of Alma near Lac-St-Jean, the enormous lake that flows into the Saguenay river. 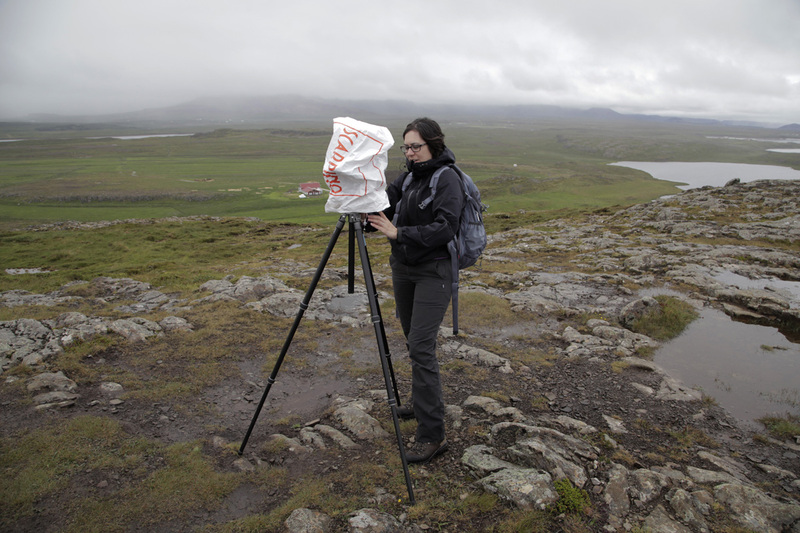 I was an artist-in-residence at a digital arts production centre called Sagamie where I was printing large-scale images from my Vinland Sagas series. After a week of work I decided to explore the area for myself. 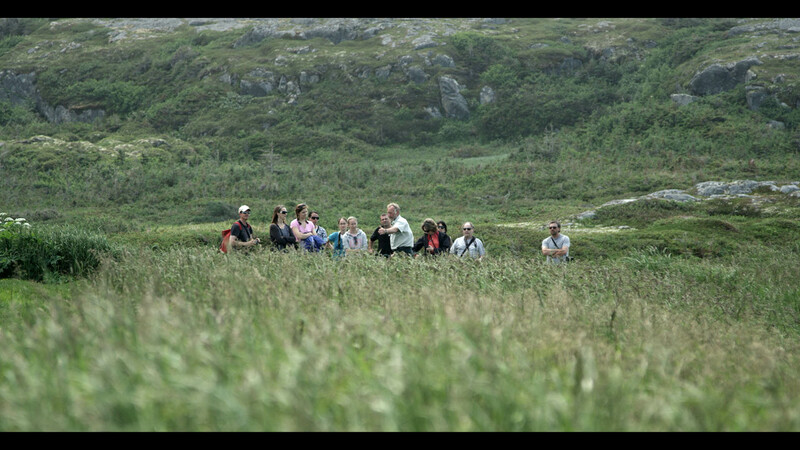 I asked some locals if they had heard stories of Viking-age settlements in the area. They were generally amused by my question but pointed me to the town of St. Rose du Nord, where a company called “Les Artisans du Fjord” builds Scandinavian-style homes and saunas. St. Rose du Nord is also known as “the pearl of the fjord” for it’s picturesque setting. In summer, the quaint village becomes a major tourist attraction offering boat tours along the fjord. Photos by Jessica Auer. Although I did not find any signs of ancient Viking settlements, the drive along the fjord reminded me of my travels throughout Scandinavia. The topography and climate would have made the Norse feel at home. Could it be possible that the saga descriptions of Vinland include parts of Québec? Then “Staumsfjord” described in Eirik the Red’s Saga may be the Saguenay. Comparison of the shape of Vinland from the notorious Vinland Map (inset) with the Gulf of St. Lawrence, Saguenay and Lac-St-Jean region. The chance discovery of North America, or Vinland as the Vikings called it, is the fundamental inspiration for my artistic investigation. Yet I’ve been holding off on discussing the event in detail, taking the time to study the Viking world in Scandinavia before trying to understand the significance of Norse travels to a new world. But recent news in the archeological world prompts the urgency to respond to the recent discoveries. This past week, CBC television aired a documentary on the The Nature of Things hosted by the famous Canadian environmentalist David Suzuki. The documentary titled ‘The Norse: An Arctic Mystery’ presents the research of Canadian archeologist Patricia Sutherland at a site called ‘Nanook’ on the south coast of Baffin Island. There, Sutherland has unearthed several artifacts that point to Norse origins, which leads her to believe that Baffin Island was a trading post between the Norse of Greenland and Scandinavia and the Dorset people of the Canadian Arctic, and potentially the first point of contact between the people of Europe and the Americas. The suggestion that Norse explorers set foot on Baffin Island comes as no surprise. In the two sagas that describe the discovery of Vinland, The Saga of the Greenlanders and Eirik the Red’s Saga, references are made to places that the Viking voyagers explored. In one version of the events, a ship traveling across the North Atlantic to Greenland is blown off course and sights new land. Then subsequent expeditions to explore these lands are made by Leif Eriksson, son of the Greenland colonizer Erik the Red. As Leif travels from north to south along these uncharted coastlines, he gives names to these new lands; the northernmost he calls Helluland (stone-slab land), which is today commonly accepted as Baffin Island. The lands further south he calls Markland (forested land), probably Labrador, and finally Vinland – its location and extent are still disputed. 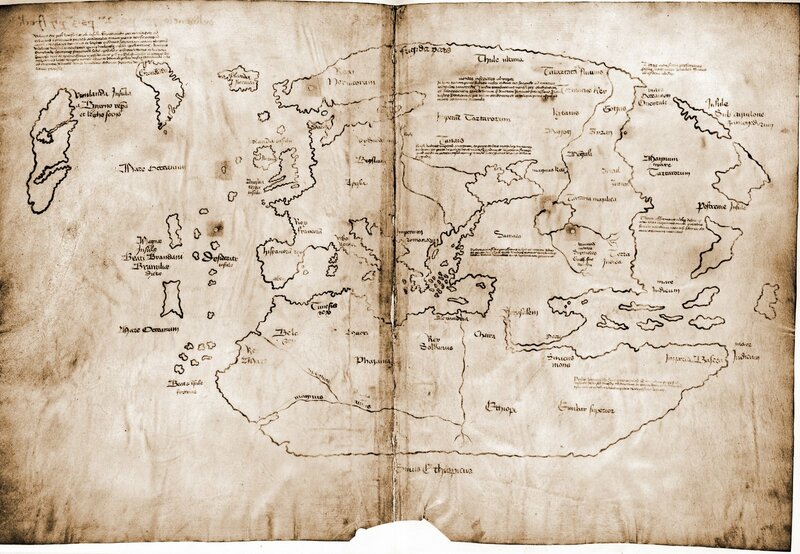 The Vinland map, which was believed to be from the 15th Century but now considered a forgery, shows “North America” at the top left. Perhaps the three peninsulas that make up the New World constitute Helluland, Markland or Vinland. We may never be able to come to understand the knowledge of the map-maker which is part of the beauty of this mystery. Image borrowed from the Internet. 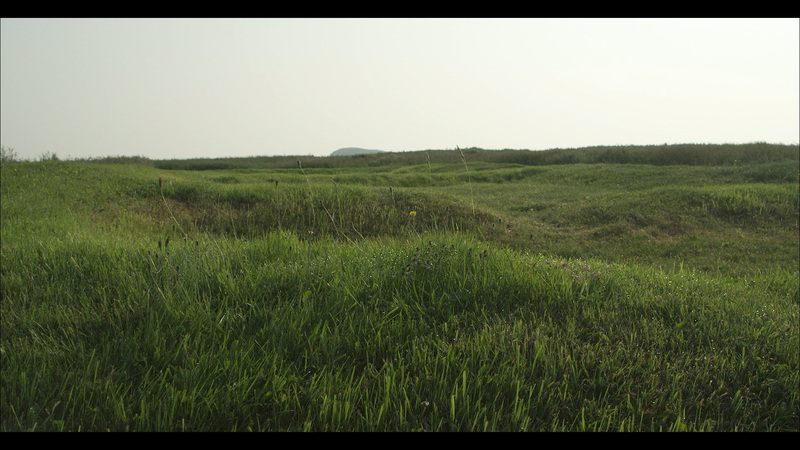 In the CBC documentary, Suzuki opens up by stating, “The history books say that first contact between Europeans and native North Americans happened with Christopher Columbus in 1492, but what if they are wrong?” But David, let us not forget that in 1960, archeologists confirmed the grassy mounds at L’Anse aux Meadows to be the remains of a Norse settlement. Although Sutherland’s discoveries on Baffin Island may prove that first contact happened earlier than Columbus, we already know that Vikings were the first Europeans to discover North America around the year 1000. They most likely made contact with the native inhabitants but the encounters described in the sagas have not been confirmed by archeology. Despite the science of archeology, I have always maintained that a certain amount of interpretation and imagination make up part of the practice. Could it be possible then, that Sutherland, with all of her enthusiasm, can actually will her theories to become true? As an artist, I personally find that fascinating. But back to the story: in a scandalous turn of events, Sutherland was recently dismissed from her curatorial position at the Canadian Museum of Civilization. The reason for her dismissal is not being disclosed but reader comments on the CBC website point to politics on Arctic sovereignty. This connection would be senseless and sad indeed, at a time when we should be celebrating the cultural links between nations of the north rather than taking nationalist and corporate points of view from further south. Yet keep in mind, like all the other mysteries, my perspective is only based on speculation. In September of last year, as the winner of a short-story writing contest, I joined an Adventure Canada expedition that sailed from the west coast of Greenland across the Davis Straight and down the coast of Labrador. In this photo you can barely make out land on the horizon. This is Baffin Island but it was most likely the place the sagas described as Helluland. Scan from a 6x7cm negative. Photo by Jessica Auer. The idea of site can be powerful. It implies more than a place, which can simply exist without context. A site is more specific. 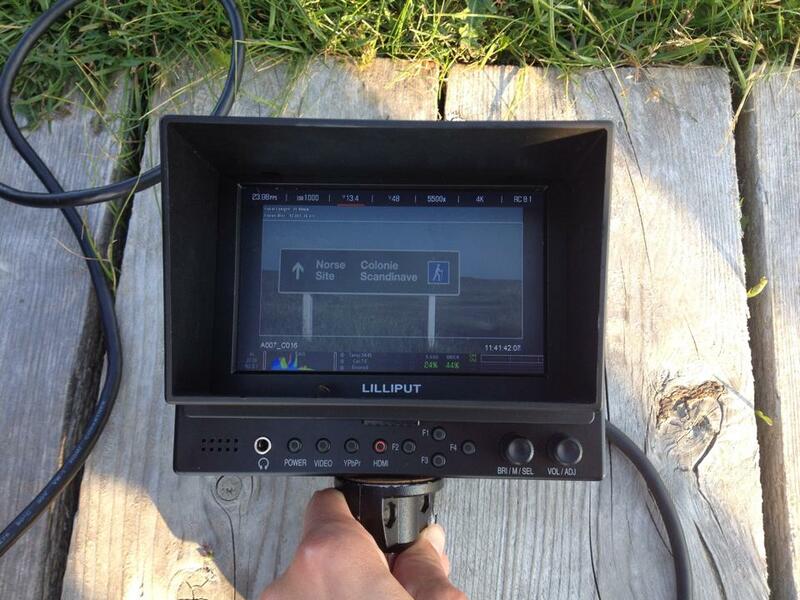 It relates to something external that has acted on that location therefore adding to the meaning of a place. Making meaning visible is part of what photographers seek to do. In 1996, photographer Joel Sternfeld released a collection of landscape photographs, which he made at various locations in the US where crimes had been committed. On This Site: Landscape in Memoriam explores the banality of the settings where these illicit events occurred, but it also shows how landscape imagery has the power to engage the viewer in an act of contemplation. In this case, the audience is given the opportunity to imagine what may have happened there. 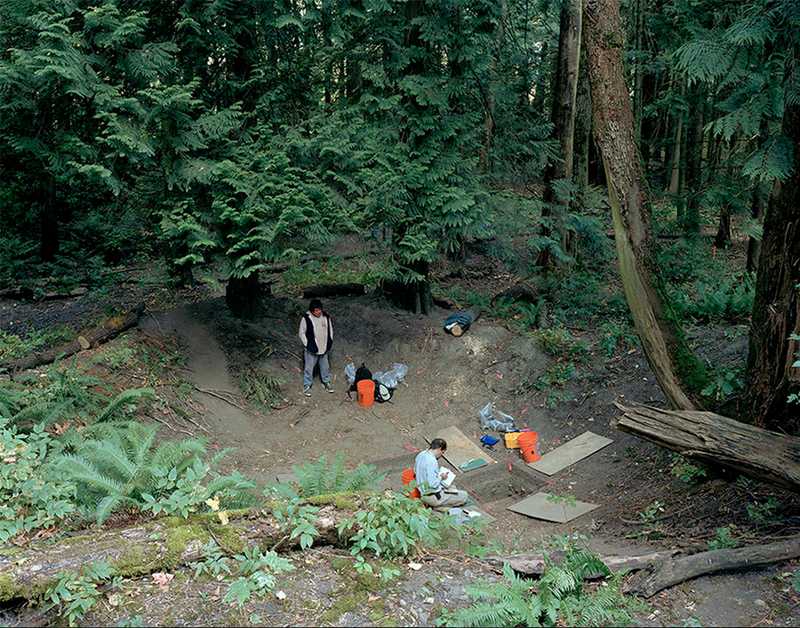 Sternfeld includes text with this project, offering details of such events and providing a certain amount of context for the photographs, yet it doesn’t compromise the artistic approach of his work. 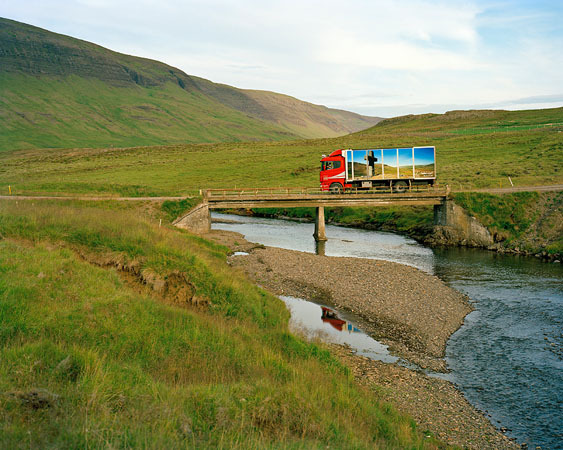 His series reminds me of what I am trying to point to and what other photographers have already done in regards to saga sites: storytelling through landscape. 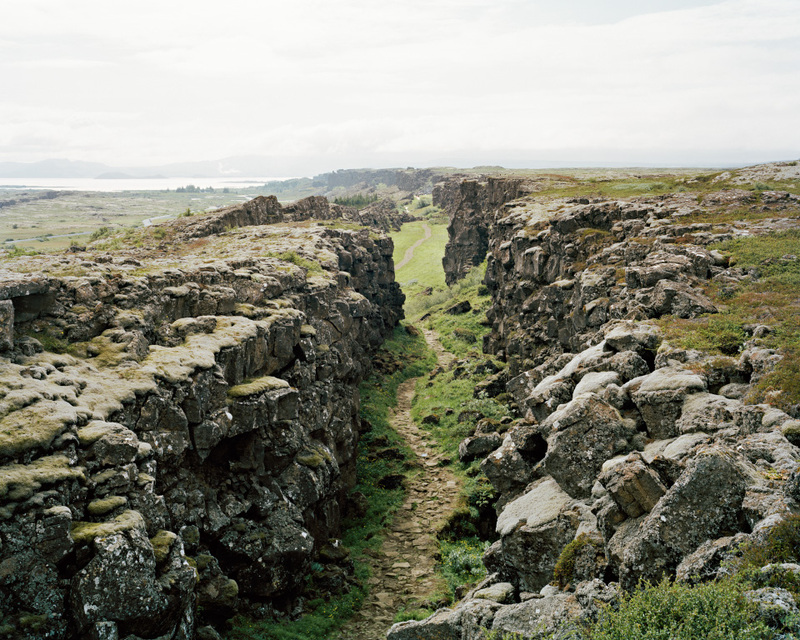 On this blog, I have posted photos of Drangey Island, where outlaw Grettir the Strong made his last stand, and Thingvellir, Iceland’s national assembly site, where several court dramas transpire throughout the sagas. But personally, my favorite saga site so far is Berserkjahraun (Berserker’s lava field). In the Eyrbyggja Saga, two Swedish Berserkers, insanely violent characters that could psyche themselves up for battle, are set to an impossible task by a farmer: to clear a passage through a lava field in exchange for the farmer’s daughter’s hand. Once the Berserkers succeed, the farmer who never intended to give up his daughter, murders the Berserkers by trapping them in a scorching sauna and slays them as they try to escape. Though I have no idea where the sauna scene actually took place, I can still imagine two crazed men, blazing a trail through this lava field. Scan from a 4″x5″ negative. Photo by Jessica Auer. For the photographer, artist or researcher, the idea may not be just about recording images of these sites and re-telling stories, but the experience of visiting them personally. In the summer 1897, British artist W.G. Collingwood traveled throughout Iceland on horseback, making drawings, paintings and photographs, which he later published as an illustrated account of his expedition. 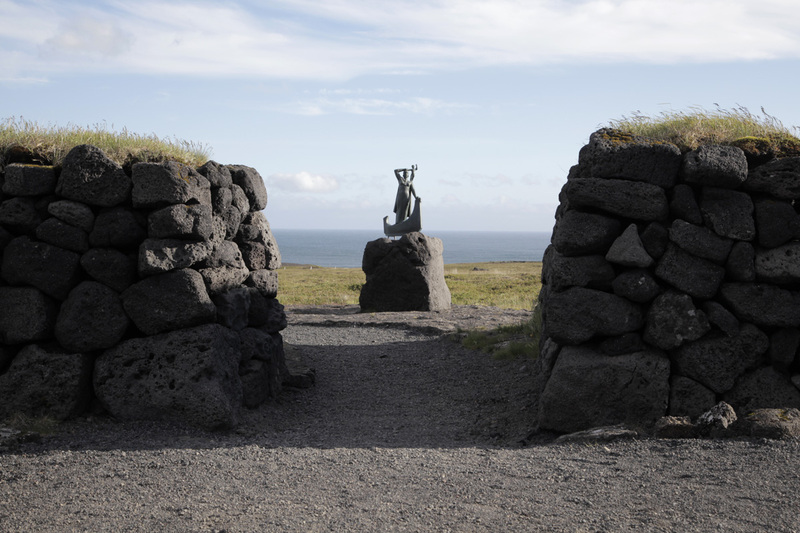 Between 2007 and 2009, at the same time I was photographing at L’anse aux Meadows in Newfoundland, Icelandic photographer Einar Falur Ingólfsson produced his series Saga-Sites, for which he followed in Collingwood’s footsteps, documenting saga sites with a view camera. And in 2011, the same year I first visited saga sites in Iceland, a 33-year old PhD student named Emily Lethbridge set out on her own pilgrimage to read each saga on location. Photograph by Einar Falur Ingolfsson. Saga-Steads In the Footsteps of W.G. 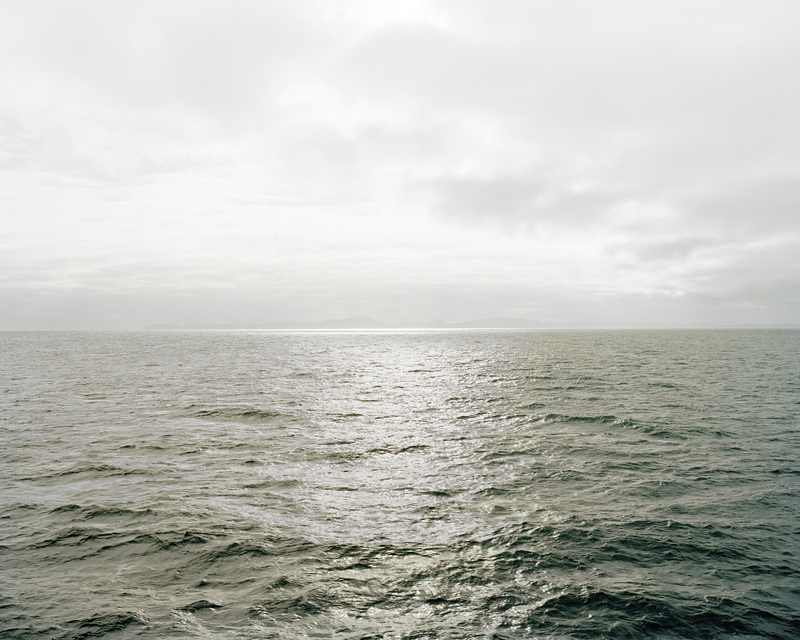 Collingwood, a photographic project (2007 – 2010). So why bother to explore a subject that has been covered by others who have done it so well? Because each of us presents different perspectives on the notions of ‘being there’. 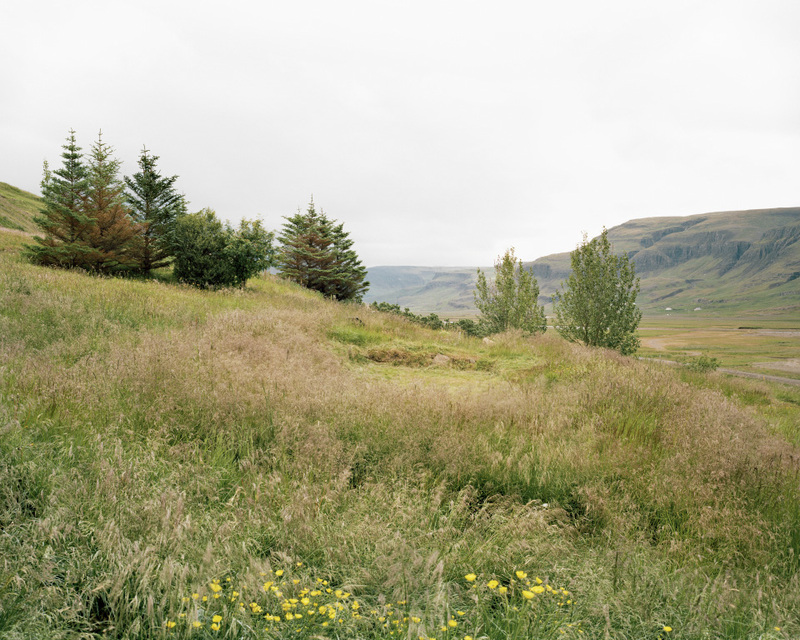 In a short documentary on Einar Falur Ingólfsson’s saga project, he claims that he is trying to capture reality in an objective way, saying that a photographer should be there to observe and not force himself into the plot. In the meantime, I will continue to question how my presence at these places adds to the history of the site.